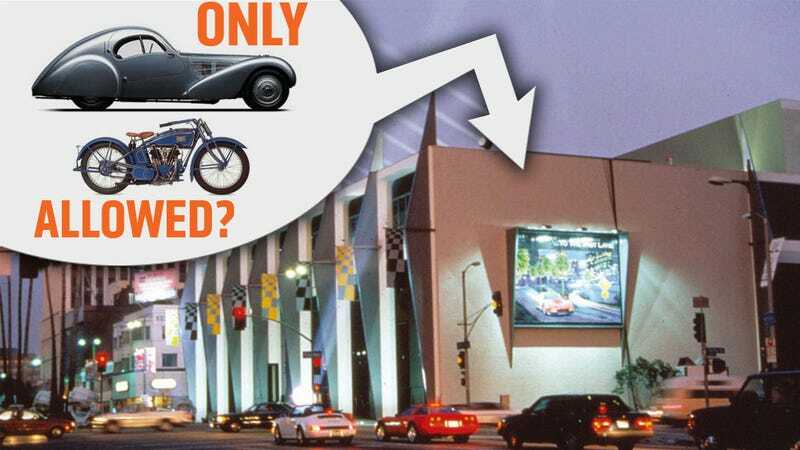 In an unexpected move, Los Angeles' Petersen Automotive Museum is undertaking a pretty dramatic change of direction, selling off about a third of its collection to make improvements and renovations. That's not the unexpected part. The unexpected part is that the museum will now focus more on motorcycles and avant-garde French cars. Now I have nothing against motorcycles or French avant-garde cars — hell, I get weak-kneed by samples from both those camps with embarrassing regularity — but that sort of focus does seem a bit at odds with the more generalist and populist nature of the museum to this point. The Petersen's 400 or so car collection will be about 120 cars lighter, and while some won't be missed, really, like some late-model modified Caddilacs or relatively common recent exotics, there's a number of good things going out the door. Aside from my personal pain at seeing one of the 1963 VW movie Herbies go, the bigger loss looks to be what they're selling off from the Petersen's hot rod collection like this '32 Ford Highboy Roadster. Hot rods were of great interest to Petersen himself, and a distinctly Southern Californian institution, and it was always great to know the Petersen treated their history with interest and respect. It'd be a shame to see that go. I haven't been able to get in contact with Leslie Kendall, curator at the Petersen, but in past conversations with him I know he valued the Petersen's very accessible collection and their openness to a wide variety of automobile types and cultures. They were a museum as ready to mount an exhibit of pickup trucks as they were Art Deco cars or even Eastern European oddities. We'll keep trying to get Mr.Kendall's take on all this as soon as we're able. I can't speak to what the Petersen has planned — they will announce more details in August at the Pebble Beach Concours D'Elegance — but we can perhaps speculate a bit based on their new (from January 2013) chairman's taste. Peter Mullin founded the incredible Mullin Automotive Museum, which does focus on Art Deco and Avant Garde-design cars, especially French. While I love the cars in that collection, I sincerely hope enough of the old Petersen's mission is left to allow displays of the lowbrow, unlovely, and otherwise unloved but important and incredible cars that so many of us want to see and understand.